I am a Scottish Power customer - am I affected? In April, Scottish Power announced a price increase of 5.5%, but did you know in August they increased their prices again by 3.7%? Did you also know you could be saving over £400 a year by switching? Find out how much Scottish Power are increasing their costs, as well as what you can do to avoid it and why you should compare. If you are on Scottish Power’s standard or ‘variable’ tariff, your annual energy costs might increase as much as £63 extra a year. Average dual fuel bills will increase by £63 to £1,211/yr, based on typical use – a 5.6% increase in total. This rise in prices will affect approximately 960,000 Scottish Power customers, or a third of households according to the energy company themselves. 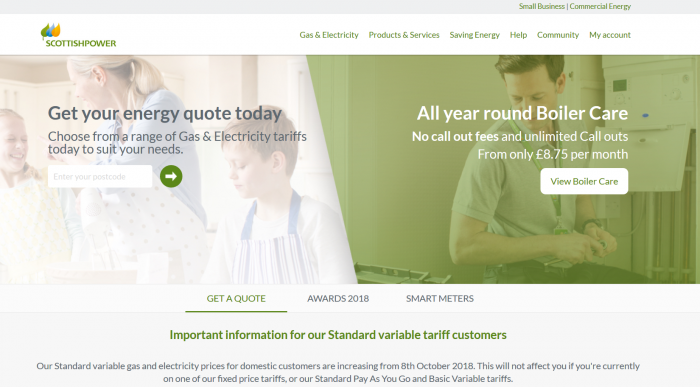 One of the more expensive energy suppliers on the market, even without the price increase you could be saving £100s a year by comparing and switching to a smaller company with better rates and customer service. I am a Scottish Power customer – am I affected? Unfortunately, you will experience changes if you are on the standard variable tariff. Customers will see their costs increase by up to £100 this year, with all of the main energy suppliers raising their costs this year one after the other. According to some reports, most energy companies wait for the first supplier to raise their prices then announce their own so there is less news coverage focused on them. This is why you should consider switching energy suppliers whenever possible. Plus, if you take a look at the EnergySeek guides, you can learn more about your top choices including what their costs are and customer satisfaction. These specific tariffs that change due to price increases do not have fixed terms that lock you in. So you can actually switch at any time.